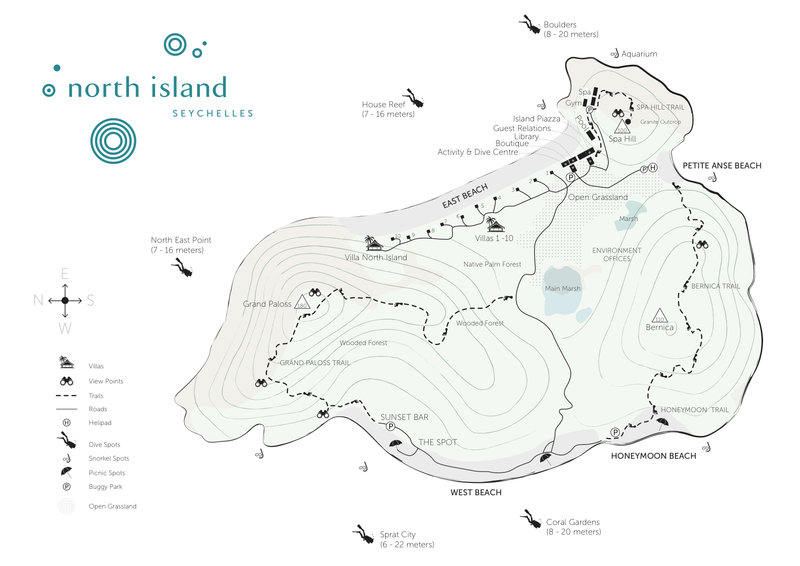 North Island boasts 201 hectares (almost 500 acres) of tropical island paradise, with three dramatic granite peaks offering spectacular scenery and epic trails for hikers. Guests can join our Environmentalists on guided walks and pair them with unique experiences to make the most of the exquisite environment while exercising on North Island. Approximately 1 hour (in total, up and down), Spa Hill Hike is the shortest of the 3 walks, but one of the steepest. 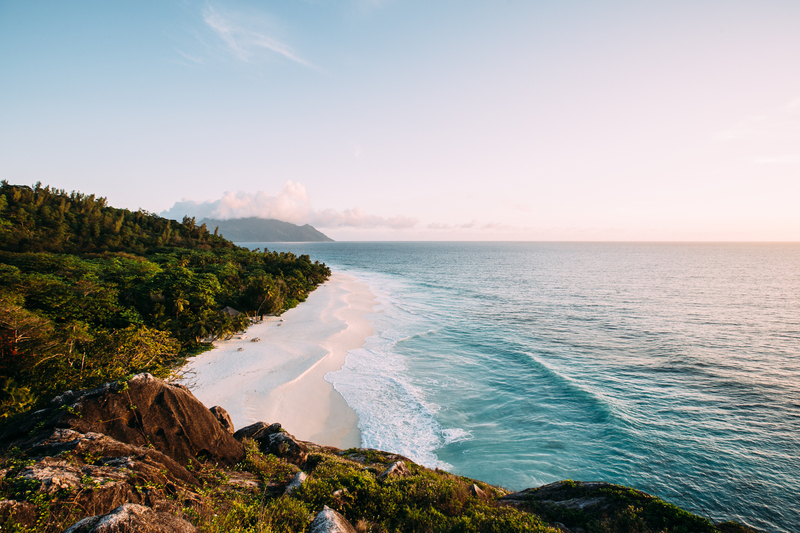 The trail starts and ends at the Spa, with 360 degree views across the Seychelles at the top. It involves stairs as well as a bit of ‘climbing’ to make it up the giant granitic boulder at the top, so it’s worth wearing proper walking shoes with good grip. For an unforgettable experience, we suggest doing this walk at sunrise and enjoying a light breakfast picnic on top while you drink in the view. This walk is approximately 1.5 to 2 hours long, with a more varied trail that starts at Petite Anse and ends at Honeymoon Beach. It takes you through exotic leafy trails and has numerous lookout points with stunning views of Silhouette Island. Take a refreshing dip in the ocean when you reach Honeymoon Beach – your Villa Attendant will have your towels ready and waiting on request (as well as snorkeling gear if you’re up for it). 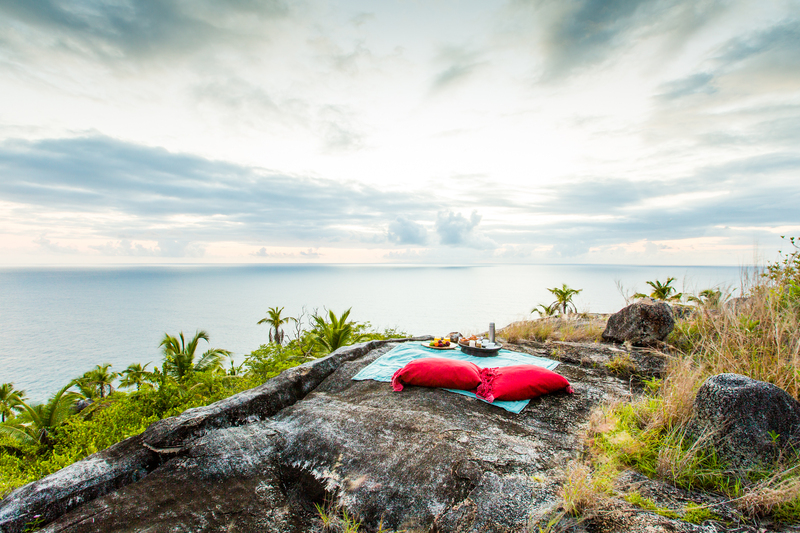 Better yet, book Honeymoon Beach for the rest of the day and enjoy a private beach picnic. Grand Paloss is the most challenging trail (approximately 2.5 hours) which begins in the cool wooded forest at the base of the saddle road and ends at West Beach. It takes you on a meandering path through dense tropical vegetation – the only place on the Island where you can’t hear the sound of the waves below – around a granitic boulder with the help of a rope, back into the forest, which opens up to an expansive granitic outcrop on the other side with staggering views. All before a downward climb to West Beach Bar in time for well-deserved sunset drinks (though who needs an excuse!). Your Villa Attendant will be waiting with cold face towels and your private Island buggy to drive you home. 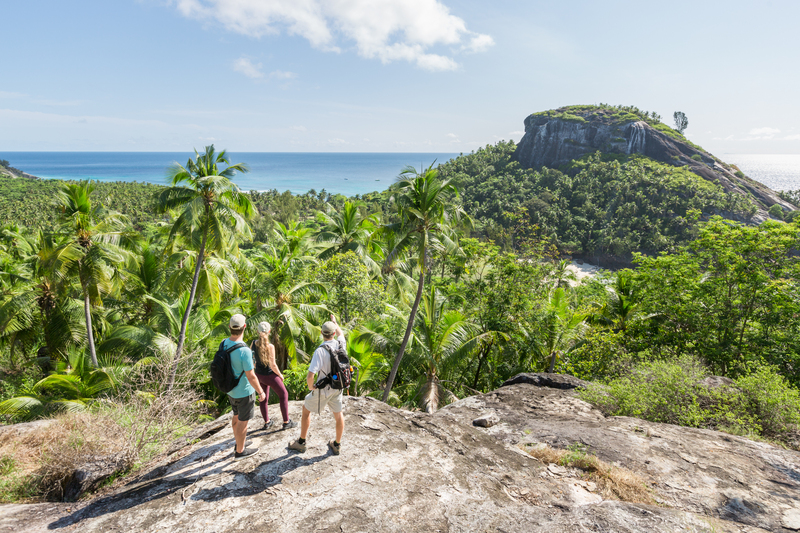 All of our guided walks are private, just you and one of our Environmentalists who will help you spot endemic Seychellois fauna and flora along the way, from White-tailed Tropicbirds flying overhead to Wedge-Tailed Shearwater chicks nesting underfoot. They will share the history of the Island with you and tell you more about how we are turning back the hands of time through our Noah’s Ark rehabilitation programme. Depending on your interest and your fitness levels, the walk can be as long or short as you wish.